This authentic Japanese restaurant provides fresh, top-quality dishes at very reasonable prices. Hokkaido has a unique menu for their ramen, udon, soba, don and bento main courses. Even if you don't fancy your noodles in soup or if you're 100% vegetarian, the restaurant will have a specially-made Japanese meal for you. From torikatsu and teriyaki chicken for the chicken lovers to the sukiyaki and nabeyaki meals for the hotpot lovers, there's always a dish for everyone – even for the fussy-eaters. Also, if you're a fan of spicy food, don't forget to try out their Hot Dragon dishes. 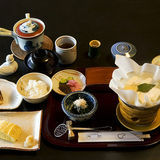 Hokkaido's meals revolve around their four main types of soup: soy-based, miso, shio and vegetarian. The soups – other than the vegetarian soup – are essentially chicken soup infused with flavours from fish and shellfish and a touch of rock salt, which is rich in minerals. Although their exquisite delicacies are of fine, fresh quality, their sushi and sashimi selection is rather simple and limited as it only comprises of salmon, king fish, prawns and oysters. Hence, do not expect to feast just on their compilation of seafood dishes. Conveniently located in Circular Quay, this restaurant is close to the Sydney CBD and Darling Harbour. All in all, Hokkaido adopts a casual setting and is a pretty decent place for a unique, healthy and affordable meal. Why? Fresh, authentic and affordable.